Why is My Bitcoin Transaction Pending or Unconfirmed? Fees explained.. If you’re reading this post I assume that like many others, you sent a bitcoin transaction and was kind of confused as to why it’s still listed as “unconfirmed” or “pending” after a few hours or so. I mean Bitcoin transactions are supposed to be instant right? In this post I want to try and explain in a very basic way how a Bitcoin transaction works and why the fee that you attach to each transaction has a crucial role in how long it will take the transaction to go through the network. Whenever you send someone Bitcoins, the transaction goes through different computers running the Bitcoin protocol around the world that make sure the transaction is valid. Once the transaction is verified it then “waits” inside the Mempool (i.e. in some sort of a “limbo” state). It’s basically waiting to be picked up by a Bitcoin miner and entered into a block of transaction on the Blockchain. Until it is picked up it’s considered an “unconfirmed transaction” or a “pending transaction”. A new block of transactions in added to the Blockchain every 10 minutes on average. However since there are so many transactions lately due to the price increase, and a block can only hold a finite amount of transactions, not all transactions are picked instantly. So you need to wait for a certain amount of time until a miner decided to pick your transaction out of all of those sitting around in the mempool. How can you make sure your transaction will get included in the next block? Simple. By adding a big enough mining fee to it. You see one of the ways miners get paid for their work is by collecting the fees on the different transactions. 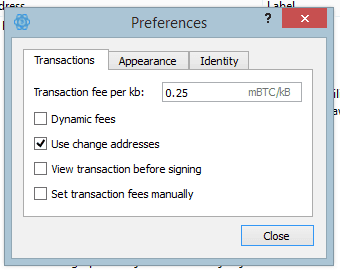 So naturally they would prefer to include the transactions with the highest fees first. If your fee is high enough – your transaction will go through faster. How can you tell how much is the right fee? Fees are calculated by the size of the transaction. Every transaction has a size, just like a file size. The size depends on many factors that I won’t go in to at the moment. The fastest and cheapest transaction fee is currently 60 satoshis/byte. So if, for example, your transaction is 257 bytes, you will need to pay 257*60 = 15,420 Satoshis as a transaction fee in order to be included in the next block. You can’t, at least not without extensive knowledge of how Bitcoin works. Your wallet is supposed to do this for you. Most wallets today will either automatically add the required fee to get the transaction confirmed as soon as possible or will let you choose from a variety of fees according to the requested confirmation time (e.g. fast, medium, slow). Greenaddress – GreenAddress is the first Bitcoin wallet to include a replace-by-fee option. With it, users can increase fees on their transactions and increase the likelihood a miner will include a transaction in a block. Clicking on the “bump fee” tab opens a mini-menu. On top of the menu, text displays how fast the transaction is expected to confirm. The menu allowed me to bump the fee: times 1.5, times 2 or times 3. For each Satoshi/byte category you can see the number of unconfirmed transactions as opposed to the transactions that went through. 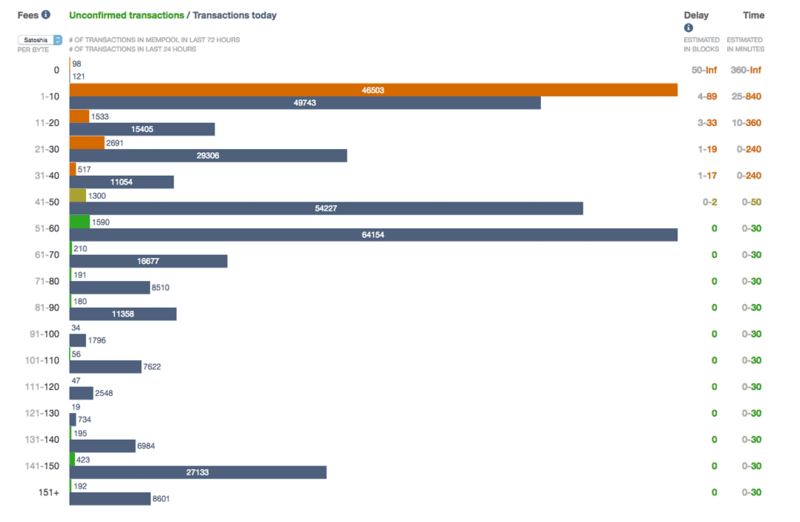 For example, 15405 transactions with a fee of 11-20 Satoshis/byte went through the system in the last 3 hours as opposed to 1533 that are waiting for confirmation. On the right hand side you can see the estimated number of block confirmation / minutes you’ll have to wait until your transaction gets included. What happens to transaction that don’t get confirmed ever? Basically transactions stay in “limbo” (i.e. the mempool) until they are included in a block. However, if a transaction stays inside the mempool for too long the different computers holding it (Bitcoin nodes) may just drop it from their system. In this case the transaction will be canceled. Just recently VIABTC (one of the largest Bitcoin mining pools) started offering a new transaction accelerator service. With the Transaction Accelerator for delayed transactions, users can submit any TXID (Transaction ID) that includes a minimum 0.0001BTC/KB fee to ViaBTC. The pool will then prioritize to include the TX in the next block when possible at no extra charge. A maximum of 100 TXs submitted can be accelerated every hour. Important: Transactions are received on a first come first served basis so try to submit yours at the beginning of every hour to get into the queue before it fills up. So I hope this clears things up a bit. Next time before sending a Bitcoin transaction make sure to add the appropriate fee in accordance to the wallet you are using. If you have any more questions or insights about Bitcoin fees feel free to leave them in the comment section below. I have 2 transactions pending . I have send the requested amount and fee from my blockchain wallet,but i have not received the btc. Already been 5days. Any help to claim the promised btc? I made my first transaction from coinbase account (BTC) to my Electrum wallet (mBTC). I messed up by putting the receiving amount in mBTC but the sending amount from coinbase was BTC.. Now under my receive tab in my wallet is shows a large amount still pending. Of course transaction is complete and confirmed. How can I get that pending money?? Please help! My account still says pending buy in my blockchain even though money was taken out of my account. Its been 1 week now. Any help? I “received” BTC to my Coinbase wallet on 7/7/2018. It had 92 confirmations at one point. Does this also show the BTC going out? I did not send anything from my account. Coinbase just said they are working on it, but no further replies. I don’t understand how payouts work. Or wallets or how to get either. Just to clarify, this “Steven” is not me, as you can see he’s using a guest account. I can’t vouch for the website linked here – be careful with random website links, guys! There’s an incoming transaction in my Coinbase that has been pending for more than 24 hours. It says I will recieve my bitcoins by end of day on January 22. So far, nothing. It has 250+ confirmations and it’s still pending. This is getting frustrating. I don’t know my transaction ID but this is the address that the bitcoins was sent to.